Talking about Amarone della Valpolicella (just call it Amarone) always presents a problem. How do I explain the contradictions in a way that makes sense? On the one hand, Amaraone wines can be described as full bodied, bold and powerful: characteristics that wine critics refer to as male. But they are also amazingly balanced, roundly soft and supple with a lingering and delicate finish; not characteristics used to describe a “masculine” wine at all. And they are not inexpensive, but offer great value. They also hint at sweetness, but are completely dry. Understanding these contradictions requires some discussion of the region, the grapes and the process in which these grapes are made into such remarkable wine. 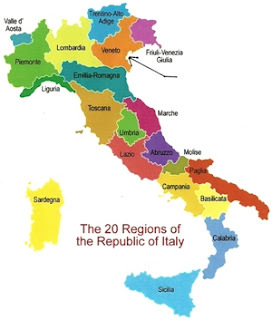 ﻿﻿ Amarone (ah-mah-ROH-neh) is made from the indigenous grapes of the region near Verona within the western Veneto (see map). Big-bold-dense red wine is made from ripe grapes grown in warm and sunny areas (think Napa Valley Cabs). But the Veneto is cool. Corvina is the primary grape. It provides structure and aromatics. Rondinella rounds out the body. Molinara provides acidity. And sometimes Negara is also used in the blend. These are the same grapes used in making Valpolicella, an enjoyable enough table wine, but nowhere near the character of Amarone. So what makes Amarone different? (So different, it was awarded DOGC status in December of 2009). To begin, grapes for Amarone are left on the vine longer in order to develop more ripeness. Of course, this exposes the grapes to the danger of rot in cool rainy weather. Assuming a successful harvest, the grapes are picked (hand selected bunches) and traditionally left to dry on split bamboo mats for as long as five months. (The exact time varies from producer to producer. Three months is common.). Grapes that burst open and release their juice – because of these mats – won’t sit in their juice. Instead the grapes shrivel, further concentrating their sugar, acids, tannins and flavors. Stelle $70 2015-2032, '08 Masi Costesera $45 Now - 2020. Finally, the grapes are fermented in temperature controlled stainless steel tanks. The reduced water content in the must can slow down the fermentation process and increase the risk of both spoilage and volatile acidity. Most Amaraones are fermented between 30 – 50 days. After fermentation, the wine is aged in wood (size and type vary with producer) sometimes as long as five years (must be two years for “Normale” and four years for “Reserva”). ﻿ In the glass, an Amarone is deep purple with a cherry rim. The aromas are rich with stewed plum, raisin and date (that hint of sweetness). The mouthfeel is lush and velvety smooth with tastes of plum, cherry, smoky dark chocolate and a hint of licorice. This is a very dense wine with texture, a port-like body, and the fruit is perfectly balanced and seamless against the wine’s acid. When the term “complex” was first used as a wine description, its inventor must have been tasting an Amarone. It finishes creamy but fresh, teasing your palette with a long aftertaste. There’s some warmth on the back palette from the alcohol, but it’s pleasing and delicate due to the wines balance. Your brain detects a hint of sweetness, although the wine is dry. The reason it is dry (back to fermentation) is simply that. Sugars are completely fermented into alcohol by the yeast. Another Valpolicella – called Recioto – is made by stopping the fermentation process before it is complete. This leaves residual sugar and makes for a nice dessert wine. If $50 is not something you’re willing to spend, the “Mizer” has a suggestion: Try another Valpolicella - this one called Ripasso. Known as “baby Amarones,” these are Valpolicellas fermented a second time with the skins used in the making of Amarone. The skins contain much of the tannin and “beef” up the wine. Some producers, like Masi, use fresh dried grapes instead of Amarone skins because they believe old skins add bitterness to the wine. These wines can be great values in the $20 range and are richer and deeper than regular Valpolicellas priced just a few dollars less. Regardless of choice – whether an Amarone or Ripasso, these are not wines to open and enjoy. My last Amarone (and Ripasso) benefited greatly from air. In fact, I opened the bottles three hours before serving and could taste improvement in the wines with each passing hour. Save your money and decant, don’t aerate. Patience is a virtue too with these wines. They benefit from aging, becoming softer. If you don’t have conditions that allow for aging, Tomassi makes a more modern style Amarone that is suitable for drinking upon release. Today (May 2013), that is the 2008 vintage. While it too would benefit from aging, it’s more fruit forward and can be enjoyed now. Everyone tells you (and they’re right) that these are wines for beef. A roast is great. Game meats are good. But if you want to have fun, save some Amarone for walnuts and cheese at the end of the meal. If you really want a treat, drizzle a little honey over chunks of aged Parmigiano-Reggiano, enjoy the cheese and then sip the Amarone. These wines are labors of love that you’re sure to fall in love with.